Come join us on the waterfront as we host The Chamber Collaborative of Greater Portsmouth's monthly Business After Hours. 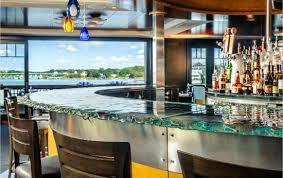 Enjoy an evening of tasty treats, delicious libations, and friendly networking, and enjoy our endless waterfront view. Guests who are considering membership in The Chamber Collaborative are welcome at Business After Hours up to two times each calendar year. The guest fee is $10 per person.